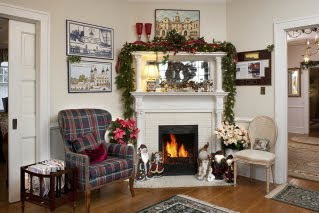 The Holiday Season is a joyful time for us here at Abbington Green Bed & Breakfast Inn. The Montford Historic neighborhood has more than 600 structures in it listed on the National Register of Historic Places. Abbington Green has the Main House dating from 1909 and the Carriage House dating from the early 1920s. We are only a few blocks north of Downtown Asheville, North Carolina and are surrounded by other historic homes and hundred-plus-year-old trees and, of course, our prize-winning English gardens. The setting is beautiful even when it's not Christmastime. The magical lights of the season are visible in different ways around the neighborhood. 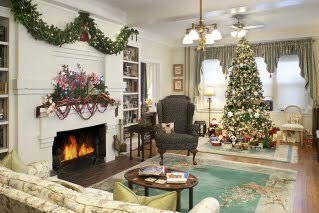 Some homes and bed and breakfasts have lots of lights outdoors, while other may have lighted candles in their windows. When you drive up to Abbington Green Bed & Breakfast close to sunset or later, you won't miss it! 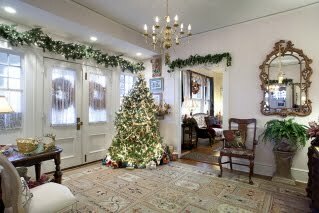 You'll see garlands and greenery lighted with clear lights on our porches and eight full-size Christmas trees covered in colored lights. But step inside and you're greeted with Christmas trees and decorations everywhere. I have always loved the glitter and glow of lights at this season. Each room is decorated carefully and with the hope that you'll feel a magical and comforting warmth and welcome. Our fondest wish is that you'll come and celebrate this season, bringing cherished memories with you and making some new memories of Asheville here to take home.